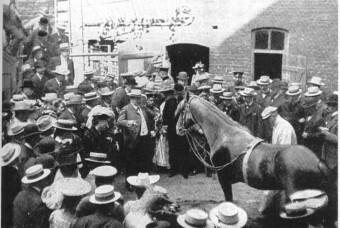 Move over Mr. Ed, Clever Hans was the original horse who could communicate with humans in complex ways. Well, at least it seemed that way at the time. This phenomenon began in the late 19th century with a German mathematics teacher by the name of Wilhelm Von Osten. He was a student of phrenology, which meant that he adhered to the belief that a person’s intelligence, among other things, can be determined by the size and shape of their head. In addition, he was interested in animal intelligence and the idea that it was greatly underestimated by the human race. As a result of his beliefs, Von Osten decided to attempt to teach three different animals – a cat, a bear and a horse named Hans. The first two didn’t turn out so well, but at least he escaped being mauled by the bear. To his delight, the horse did seem to respond to Von Osten’s mathematical tutelage. It began with Hans simply tapping out numbers written on a blackboard. Any number under 10 he could count by tapping one of his hooves. Von Osten was excited and encouraged by this progress and thus decided to test the horse further. He began writing out basic mathematical problems and attempted to train Hans to recognize simple symbols. This proved relatively easy for the animal and before long he was able to provide correct answers to a myriad of problems, including fractions, square roots and multiplication. Von Osten decided to take Hans on the road, and in 1891 he was performing free shows all over Germany. By this stage, Hans was able to spell out names with his taps, as well as tell the time and work out dates. Despite the fact that his accuracy wasn’t 100%, Hans’ abilities were impressive enough to draw large crowds, as well as attract the attention of skeptics such as the New York Times (who ran a front page story about the horse) as well as Germany’s board of education. The latter decided that they wanted to investigate Hans’ abilities, which Von Osten readily agreed to. After all, he knew he was no fraudster and there was no scandal to be exposed. The investigation team became known as the Hans Commission and it was comprised of a variety men from differing professions. These included a psychologist, a few school teachers, a circus manager, two zoologists, and a horse trainer. Despite thorough investigation and testing, the commission concluded in 1904 that there was nothing fraudulent about Hans’ abilities and that he really was a gifted horse. Despite their findings, a psychologist by the name of Oskar Pfungst remained skeptical about Hans and his supposed abilities. With the permission of Von Osten, he picked up where the Hans Commission left off and embarked on some thorough and unique investigation techniques. Firstly, he had a tent erected in which the experiments would take place. The primary purpose of this was to shield the investigation, and Hans himself, from outside distraction and contamination. He then made a large list of questions to ask Hans, as well as the variables that could effect the outcome. At first, Hans reacted to questioning as normal as usual, at least when his owner asked them. However, things began change when Pfungst began to change certain environmental factors during the questioning. For instance, he asked Von Osten to stand further away when asking Hans questions. The horses’ accuracy diminished, though nobody was sure why. As a result, the psychologist decided to try some other variables. Von Osten was instructed to ask Hans questions that he himself didn’t know the answer to, and immediately Han’ accuracy went from being roughly 89% correct to almost 0%. The same results would also occur if Hans was questioned from behind a concealing screen. It seemed that to answer questions, Hans needed to have a clear view of his questioner who incidentally had to know the answer to the question itself. The obvious conclusion would be that Von Osten had trained Hans to respond to previously prepared questions, but why then would he so readily agree to the investigation? To answer this question, Pfungst decided to continue his studies, but to switch his focus to those who were questioning and interacting with the horse. He almost instantaneously noticed certain shifts in the posture, facial expressions and breathing of the questioners whenever Hans tapped his hoof. With every tap, their tension seemed to increase ; when the correct answer had been reached, it would disappear. Pfungst thus concluded that Hans was taking these subtle shifts in tension as his cue to stop. This tension didn’t exist when the questioner was unaware of the answer to his own question, which explains why Hans had no idea what to do in that circumstance. The most fascinating part of this was that both Von Osten and any other questioner involved had absolutely no idea that they were giving Hans cues. It was all completely unconsciously done. Despite the fact that Pfungst’s investigation proved Clever Hans to be something of a hoax, he did inadvertently prove Von Osten’s own theories surrounding the intelligence of animals. Sure, Hans couldn’t really do semi-complex math or tell you the time without a little help, but he was incredibly receptive to extremely subtle human body language. It may not be the intellect that Von Osten was going for, but it is nonetheless impressive. Do owners have a clever hans effect on dogs? Results of a pointing study. I am have been a horse person my whole life. you made a mistake. the horse was trained by pin pokes. ALL horses are able to read completely and totally a persons body language and a persons emotional state. If i get on a horse I can know wholly whether the horse likes me or i like them. ALL horses if trained could do as Hans was taught. One horse on you tube is trained to open the fridge door and take a beer to his owner. it is also trained to ride in the car (convertible). sorry that you wrote an article that any real horse person in the world could have told you if asked. @mary: “any real horse person in the world could have told you if asked.” That may well be, but the Clever Hans hoax and the subsequent “Clever Hans Effect” was a significant event in the world of science, not just because it revealed to the world that some animals are more intelligent than many were giving them credit for at the time (though not as intelligent as Hans seemed at first), but also for its relationship and advancement of the idea of observer-expectancy effect, which is critical to keep in mind when doing scientific experiments. Perhaps all horses could, but Hans was the only one (presumably) anyone had attempted to teach math at that point. This makes him a pretty important example. I complete agree that horses in general are incredibly intelligent and can be trained to do impressive things such as Hans was. However, at the time of Hans people weren’t as aware of that, hence his trainer embarking on his tutelage of Han. This article wasn’t so much about telling the world that horses are smart, but about an isolated historical incident that had a large impact on the scientific world. Plus, Hans’ story is really interesting! Mary demonstrates a case of reference bias, assuming that because she has some knowledge and that knowledge has be existent for as long as she has, that it must have been known forever. Mary, it would appear that Tegan has uncovered the source of your universally known (at least to horse-people) knowledge. Tegan, I think it would be fascinating to look in to other common biases (confirmation bias is a favourite of mine) and major events that came about because of people being ignorant to their effect. She also demonstrates that because she assumes that “all horse people know this”, that therefore all “non horse people” should know it too. I have no idea how she came to this conclusion. A + 8 = purple? Just wanted to correct some errors in this text: Von Osten never taught a cat or a bear, also he never took Hans on the road. Until von Ostens death in 1909 poor Hans never left the court of Griebenowstrasse 10. That was what made von Osten so trustworthy, he was not interested in earning money or putting up a show with Hans. I am working on a project about Hans. Would you mind telling me where you found this wrong information? I am also investigating how the story of Hans changed through the times. @Reto: There are actually quite a lot of sources that mention his previous work with a cat and a bear. Here’s one. There are likewise many sources that do indeed say he toured around Germany showing off the horse. As you say, though, he never charged admission. He wasn’t trying to make money off the thing, just get publicity. It appears some of you have not read the book titled Beautiful Jim Key, the lost history of a horse and man who changed the world. written by Mim Eichler Rivas. Jim Key exploded on to the national scene in 1897 by demonstrating inexplicable abilities to read, write, spell, do mathematics, tell time, sort mail, cite biblical passages and debate politics.